A music promoter is someone who publicizes and promotes performances. 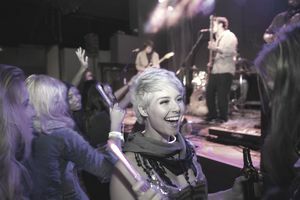 Promoters organize gigs, book bands or artists and advertise the shows to bring in paying attendees—and profits. The music promoter works with an artist or a band manager to plan an event. They agree to a date and look for an appropriate venue. The promoter negotiates any fees for the artist and then publicizes that event through radio, television, digital, or email advertising. The music promoter ensures the artists have everything they need offstage and on, from hotel rooms to sound checks. The promoter typically creates a contract outlining the terms of the agreement, including fees owed to the promoter, date and time of rehearsals, the length of the band's performance and any other demands. A music promoter usually works in a regular office and may have an assistant or a team. Some opt to meet with clients off-site, at restaurants or other entertainment locations. Others do most of their work online or over the phone. How Do I Become a Music Promoter? There isn't a formal education path required to become a music promoter. The most essential skills are a love of music and business savvy, so a degree in business or marketing can be very useful. The ability to negotiate effectively is essential, as you will need to bargain with artists, venues, hotels and more. Understanding different aspects of the business is important. Read music trade magazines to understand the latest developments and see how other events are put together. If possible, try to get an internship with an event management company. You can get experience planning and promoting major events, which can be invaluable, even if the events are not related to music. Many people start out on their own offering their services for free or at a steep discount to local bands trying to make a name for themselves. They check out smaller bars, cafes, and fairs for venue options and research lower cost options for equipment or security. While you may not make any money for the first few events, these experiences can pave the way for larger and more lucrative opportunities going forward. What's the Nature of a Music Promoter's Job? According to 2016 Bureau of Labor Statistics figures, the latest available, the average annual salary is $65,200 for those employed by companies; the projected job growth through 2024 is 2.5%. Independent promoters receive a cut of tickets sold or a business fee. If you have a strong knowledge of music, a passion for the industry, outstanding communication and negotiation skills and motivation, you may excel as a music promoter. It's a challenging and competitive career path, but it can be very rewarding work if you love what you do.